In the following article, we'll explore the stack specific options of Renew, without further ado, let's get started. As explained in the customizer introduction here open up the WordPress customizer to start, if you don't already have Renew selected, you'll need to change your stack to continue following this article. 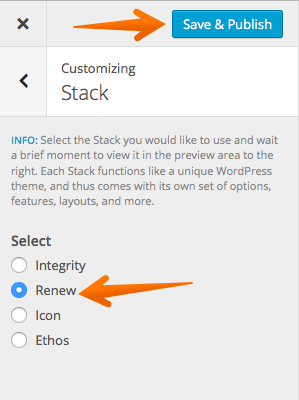 Once you've selected the Renew stack, click Save & Publish. 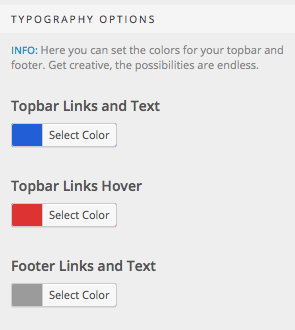 The first options specific to Renew are the colors, this allows you to change the colors using a color picker, you can change the colors of the Topbar background, the logo background and the Navbar background, all with the easy to use color picker. Clicking on Select color will open the color picker, allowing you to easily set which color you'd like as the Footer Background Color. Like all our other options we've explored so far, clicking on select color, will open the color picker and selecting your color will update the live preview instantly, allowing you to preview the color changes you've made, before saving and publishing. The last options are all related to the blog elements, if you're not already, load up the Customizer when on your blog, so you can see the changes live. The Blog Title option, is the heading which shows on your blog index page, change that to anything you want. 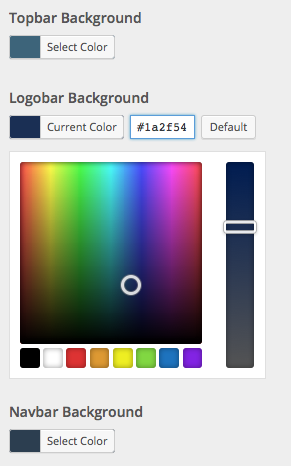 Clicking on select color, will open the color picker, allowing you to select the color for the entry icons, which will update live in the Customizer preview area. This basically allows you to set the horizontal and vertical alignment of the entry icons. Congrats! You should now have a better understanding of the options which are specific to Renew.